From the #1 New York Times bestselling team of Laura Numeroff and Felicia Bond comes the ninth picture book in the blockbuster If You Give . . . series, one of the most beloved children’s series of all time. 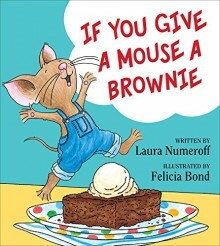 With its spare, rhythmic text and circular tale, If You Give a Mouse a Brownie is perfect for beginning readers and story time.